A recent post introduced the income-expenditure model, a staple of introductory courses in macroeconomics. In this post, a closely related model of the sectoral financial balances is considered at a similarly introductory level. 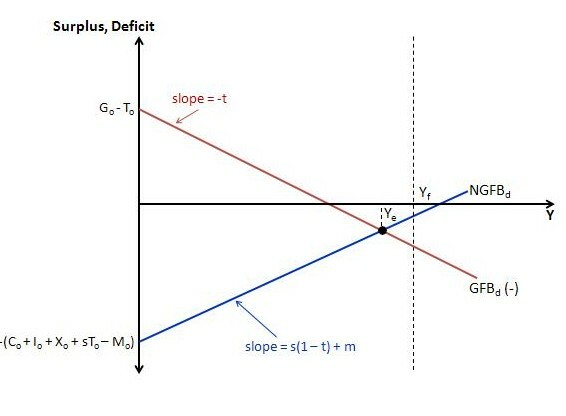 The ‘sectoral financial balances model’, or ‘SFB model’ for short, has been discussed in the blogosphere by a number of Modern Monetary Theorists, including Bill Mitchell, Robert Parenteau, Eric Tymoigne, Daniel Conceicao and Scott Fullwiler, prompted by a post of Paul Krugman’s which contained a useful diagram. Analysis of the sectoral financial balances proved insightful in understanding both the lead up to the global financial crisis and its aftermath. This claim will be substantiated once the basic model has been outlined. Cd, Sd, Id, Gd, Xd, Md and Td are desired consumption, saving, investment, government spending, exports, imports and taxes. The ‘o’ subscripts indicate exogenous variables. They are autonomous of income. The parameters c, t and m are the marginal propensities to consume, tax and import. The only difference, algebraically, between this version of the SFB model and the four-sector IE model is the arrangement of the equilibrium condition (1). 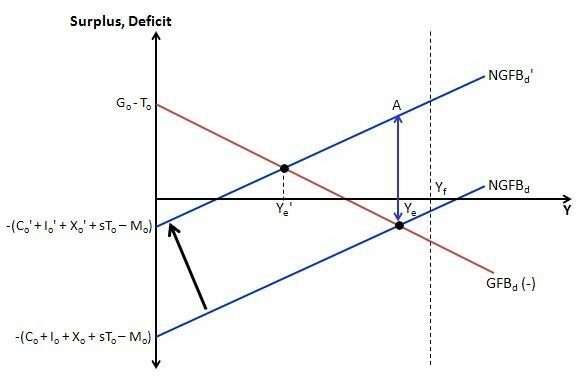 Whereas the IE model starts from the identity between income and expenditure and then adds the equilibrium condition that planned expenditure equals income or, equivalently, that planned leakages equal planned injections, the SFB model starts from the sectoral balances identity and then adds the equilibrium condition that desired sectoral balances be mutually consistent. Both models draw on the same Keynesian behavioral assumptions (2)-(7) and (8) when theorizing about disequilibrium behavior and any adjustment toward equilibrium. Basically, desired leakages are assumed to be a positive function of income whereas desired injections are set exogenously or autonomously of current income. (S – I)d is the domestic private sector’s desired financial surplus. To the extent it spends less than it earns or, equivalently, saves more than it invests, it is said to be in surplus and accumulates financial assets. Similarly, (M – X)d is the desired surplus of foreigners. When foreigners sell more goods and services to the domestic economy than they purchase from it, they accumulate financial assets denominated in the domestic currency. (Strictly speaking, net income transfers, such as interest and dividend payments, should also be included.) Taken together, the domestic-private and foreign sectors are the non-government. Equilibrium requires that the government’s deficit, (G – T)d, be consistent with the desired financial accumulation of the non-government. The SFB model relates the desired ‘non-government financial balance’, NGFBd, to the desired ‘government financial balance’, GFBd(-). Because, by identity, an actual non-government surplus corresponds to an actual government deficit (see here), the government’s financial balance is inverted, indicated by the minus sign. It is taken to be positive when the government desires a deficit and negative when it desires a surplus. To say it another way, the non-government’s desired balance is expressed as a positive or negative surplus and the government’s desired balance is expressed as a positive or negative deficit. This is an upward-sloping straight line. The sum in the first set of parentheses is the vertical intercept. A change in any of these variables causes shifts in the schedule. For example, an increase in Co shifts the schedule down, indicating a lower desired surplus for any given level of income. Changes in real income, in contrast, cause movements along the schedule. Higher income induces additional saving and imports. The term in the second set of parentheses is the slope, which is positive. A change in any of the assumed marginal propensities to leak would alter the slope. 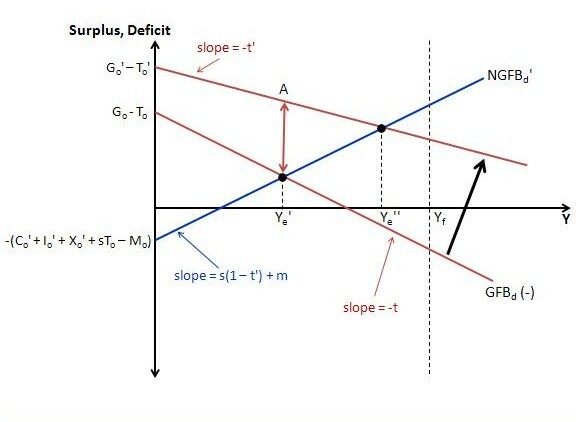 For example, a higher marginal propensity to save would steepen the schedule, indicating that the desired surplus would rise or fall more sharply with movements in income. The slope of this schedule is -t. The government’s deficit falls with income because of the impact on tax revenues. The first bracketed expression is the vertical intercept. An exogenous change in government spending or taxes causes shifts in the schedule. Income changes cause movements along the schedule. The expressions for the desired sectoral balances look cumbersome, but the vertical intercept of each schedule is a single number, so they are really quite simple. A numerical example will make this clear. Let Co = 48, Io = 100, Go = 210, Xo = 60, To = 10, Mo = 10. Also suppose c = 0.8, s = 0.2, t = 0.25, m = 0.1. Substituting this value for Y back into (A’) and (B’) indicates that the desired sectoral balances are both zero. In initial equilibrium, the government’s budget is therefore in balance and, at the current level of income, the non-government is content, desiring neither to accumulate nor run down financial assets. Suppose that full employment would require income of 900. The situation is shown in the diagram below. The government can attempt to render the non-government’s spending and saving behavior consistent with full employment by increasing government spending, cutting taxes or some combination. The multiplier in the four-sector model is 1/(1 – c(1 – t) + m). In the current example, that makes the multiplier 2. So, in principle, an increase of 50 in government spending would shift the GFBd(-) schedule up and to the right sufficiently to deliver full-employment income. This is shown below. If income remained unchanged after the increase in government spending, the government’s desired budget deficit would be at the level indicated by point A, well above the non-government’s desired surplus of zero. The notional gap in desires is indicated by the maroon double-arrowed line connecting the initial equilibrium point and point A. However, the extra demand generated by the increase in government spending causes income to adjust upwards until the two sets of desires are once again compatible. There is a movement up along the NGFBd schedule as desires for additional private saving and imports are induced by income growth. The government’s desired budget deficit is rendered consistent with non-government desires through the impact of higher income on tax revenue, shown as a movement down along the GFBd(-) schedule. Equilibrium is restored at the full-employment income level of 900. As with the IE model, the SFB model in its present form depicts the adjustment process as instantaneous. In reality, the process would take time. To depict this completely, the model would need to be expressed in dynamic terms with income and desired leakages lagging desired injections. The exogenous increase in planned government expenditure would initially result in disequilibrium as desired sectoral balances diverged from actual sectoral balances. The accounting identity between actual sectoral balances would still hold, as it always must, but the condition for equilibrium would not be met until income had adjusted desired leakages, and hence desired sectoral balances, to their new equilibrium levels. Conceptually, at least, the steps in the process can be visualized in the graph, even though the model itself does not truly capture the dynamics. The diagram below depicts the basic situation in the US (and many other countries) in the period leading up to the most recent global financial crisis. At the initial equilibrium income, Ye, the non-government desired to be in deficit, spending more than it received in income. In reality, sometimes the non-government was in surplus, sometimes in deficit, due to the surplus of foreigners who were, as now, accumulating financial assets in US dollars. The domestic private sector was typically in deficit over the period, sometimes more than offsetting the foreign surplus. For the purposes of the example, the non-government as a whole is shown desiring a small overall deficit. This happened to be compatible with the government’s desire to run a surplus. The deficits of the domestic private sector coincided with a build up in private debt, which ultimately proved unsustainable. With private households spending more than they received in income, there was a reliance on private credit creation to finance the additional consumption expenditure. The longer this process continued, the more likely it became that some households would suffer debt stress. With the onset of crisis, the domestic private sector made a sharp adjustment to its spending and saving behavior. 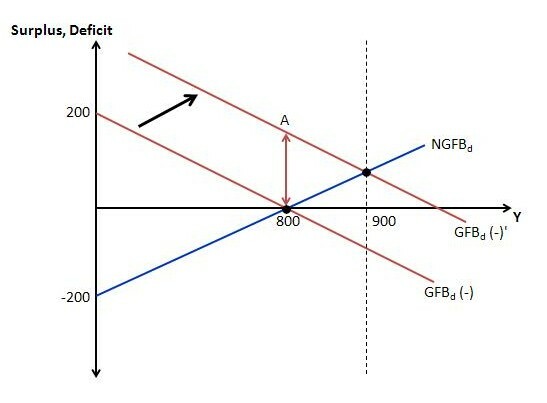 This is reflected in the next diagram with the dramatic leftward shift of the non-government’s desired financial-balances schedule from NGFBd to NGFBd‘. With the bursting of the private debt bubble, many households needed to get their debt burdens under control and so desired much higher saving. This is represented in the diagram by a reduction in autonomous consumption from Co to Co‘. The negative impact on demand also discouraged private investment, represented by a fall in investment from Io to Io‘. Although this behavior of the domestic private sector was partly offset by the impact on the foreign balance of less endogenous leakage to imports (represented as a leftward movement along the NGFBd‘ schedule), the slump was worldwide, impacting exports as well, shown as a reduction from Xo to Xo‘. The overall effect was that the non-government desired a much higher financial surplus for any level of income. If income had remained unchanged after this behavioral shift, the non-government surplus would have reached the level indicated by point A, far above the government’s desired financial balance associated with the initial equilibrium income level Ye. But, of course, the sharp reduction in demand caused a decline in income, somewhat frustrating non-government attempts to accumulate financial assets (represented by a movement down along NGFBd‘) while also hitting tax revenues endogenously (represented by a movement up along GFBd(-)). Non-government and government desires were reconciled at a new, lower equilibrium level of income, Ye‘. With real income so far below the full-employment level, Yf, it is clear that the government’s deficit is currently too small to accommodate the non-government’s desired surplus alongside full employment. The model suggests that there are two main ways to address this. One approach would focus on encouraging the non-government to reduce its desired surplus (i.e. a rightward shift of the NGFBd‘ schedule). This could only work in a sustainable way and to the degree necessary if there was a dramatic, orderly write down of private debt. Such an action would free private income for expenditure. Policies to moderate inequalities in income and wealth would also enable a stronger level of sustainable private demand. Attempting to manufacture another private debt bubble, supposing households could be enticed into it, would only serve to set off a financial crisis worse than the previous one. The existing private debt and inequality need to be dealt with first before the domestic private sector can drive sustainable income growth. The other approach is for the government to increase its net expenditure. Higher government spending and cuts in exogenous taxes would shift the GFBd(-) schedule to the right. A cut in tax rates would flatten the schedule, increasing the multiplier effects of any given level of net autonomous expenditure. Ideally, both types of policies would be implemented, but in the diagram below, only the effects of the second type of policy are shown. 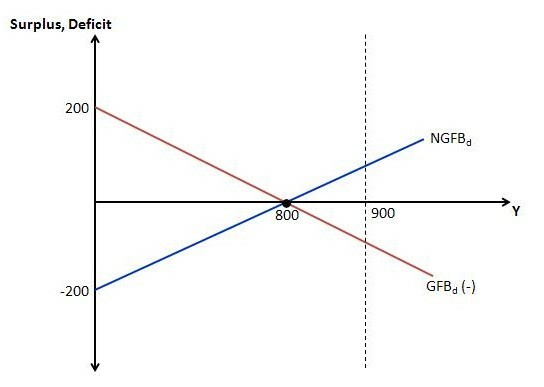 In the diagram, an increase in government spending from Go to Go‘ and a cut in exogenous taxes from To to To‘ shift the GFBd(-) schedule up and to the right. A reduction in the marginal propensity to tax from t to t’ flattens the schedule and also steepens the NGFBd schedule. The overall impact is to increase real income from Ye‘ to Ye”. In the diagram, the economy is left somewhat short of full employment. For true full employment (2% frictional unemployment) alongside price stability, either a job-guarantee program or a system of wage and price controls would be required. As Daniel Conceicao notes in his post linked to in the introduction, a job guarantee can be represented in the model by a vertical GFBd(-) schedule positioned at the full-employment level of output. This article argues that an expansionary fiscal policy is a necessary condition for growth in the long term, reasserting an old Keynesian principle that sustained expansion requires continuously growing exogenous injections to the flow of income. It is true that the present expansion, which has now lasted for more than six years, has been accompanied by a tightening of the fiscal stance, but this has been possible only because there has simultaneously been a long and sustained expansion of private expenditure financed by borrowing. The article concludes that the expansion of net lending cannot continue for much longer without making debt-income levels impossibly high; therefore, in contradiction to the political consensus of the moment, fiscal policy will have to be expanded substantially and progressively compared with what the CBO is now projecting if a prolonged recession is to be avoided. These arguments seem prescient now, to say the least. But Peter if what they were predicting was the events of 2008 (ie “unsustainable levels”) then the US ended up going on for another 10 years with increasing “debt burdens” so can we look at this as a valuable prediction if it takes 10 years to come to apparent fruition? Seems like we have much work to do to identify threshold conditions where failure is predicted for the Theory to have more utility. But don’t you think it’s pretty much impossible to predict the timing of turning points, Matt? It seems to me that the elastic nature of the credit creation process would make the timing of a crisis anyone’s guess. I do think, though, that the SFB analysis provided good insight into why the process would eventually prove unsustainable and now helps to explain why (in the absence of appropriate policy) the economy remains sluggish coming out the other side. Given the record of the social sciences other than economics, only broad trends are foreseeable and events within those trends or turning points are not predictable with any precision. Precision in social science tends to be narrowly circumscribed. Conventional economics pretends to be more analogous to natural science than social science, even though it is one of the social sciences. Therefore, most of the expectations concerning precision of prediction are simply wrong and are dependent on assuming a continuing trend when what is important to know is the future rate of change and the turning points, at least the major ones together with the causality. The heterodox view recognizes uncertainty, reflexivity, and non-ergodicty, and denies long run equilibrium, perfect foresight, rationality, and market efficiency. It’s point is that predictive precision is a chimera. Conventional economists resist heterodoxy for precisely that reason. They prefer to dwell in the chimera of knowledge instead of admitting the consequences of ontological and epistemic uncertainty when the relationship among causal factors is complex, adaptive, and emergent. Heterodox systems can give early warning signals based on causal analysis that enables preventative steps before developing problems get out of hand and eventually go viral. Instead, what we get is false confidence and dashed expectations. Peter I agree in hindsight the SFB provides a nice explanatory illustration but I think its like “giving up” to think that things like a “turn” just some how “happen on their own” and “there is nothing we can do about it”… these are systems that we create and operate….. and also “giving up” to think we cannot monitor the situation in real time and make required proactive adjustments to incomes via fiscal policy to avoid many “macro” problems… systems operators do such things all the time in other subject areas via monitoring/surveillance of the situation. The system here in the US has been pretty stable for instance from 2009 till now, going on over 5 years, albeit at unacceptably low levels of employment/output…. but even so, govt has kept interest rates unchanged at about 0% and has kept the FHA conforming loan limits FIXED at $417k MAX over the same time and total govt spending has stayed pretty stable between about $4.5T to $4.2T over this time and lo and behold: we have had a lot of stability. Again the levels are too low, but they have been pretty stable none the less … so manifestly we CAN achieve stability in these systems and I think we could also achieve it at higher and more broadly distributed levels of income and employment. We just have to watch what we are doing fiscally knowing how the system operates, and watch what we are doing in other key areas of macro policy and things could stabilize at higher levels….easily I think…. it wouldnt even be very hard imo. Matt, I would take issue that the US has been pretty stable for five years (ignoring UE). I think that the asset markets have been rather unstable and the Fed apparently thinks so, too. QE was designed chiefly to stabilize asset markets and it is still in play. The Fed has to know that ending QE would likely both tank the equity market, which would see it as canceling the Greenspan-Bernanke put, and throw a wrench into the housing market with rising LT yields — at least that seems to be the expectation. Should that occur, it would result in a global slowdown that would tank commodities, too, and we be in full-on deflationary mode. Unless, of course, government were to quickly reverse course, which it likely would. OK, five years have transpired since the GFC 2009/2010/11/12/13 so govt spending should be up 43% from 3,435 to over 4.9T and where is it? 4.2T in FY 2013 ie in the toilet..
Debt to income levels CANNOT increase without this fiscal increase…this is my point. Godley’s statement tells us NOTHING predictive, its basically accounting, Monday morning quarterbacking…. circular logic… he is basically saying: “income cannot increase unless income increases…” Is this valuable? What has happened over the last 5 years after the reset caused by the derelict libertarian “free market” Bernanke Fed and Hank Paulson Treasury letting Lehman go BK? Loans and leases in Bank Credit is FLAT. It DIDNT go up. Look at the long term chart at the link… it didnt go up either (actually went down a bit)… which is “cause” and which is “effect”? If govt does not increase Treasury withdrawals, where does the system’s increase in income come from to be able to increase system leverage? You cant “go to the bank” and say “I got a raise! I would like to borrow more money!” if govt doesnt increase Treasury withdrawals… the system has no additional income. And Tom if we take an equities hit soon, imo it will be because the govt is reducing YoY spending and earnings growth will accordingly be reduced or eliminated… which is not currently being anticipated in the so-called “money management” industry. I also talk about money. Jealous? Good illustration of how to illustrate Krugman’s Cross – I especially like the interactive elements of the short period transition, where one has to pay close attention to which sector’s preferences will tend to dominate, and why (access to credit may matter a lot here). Odd, though, that you chose to use real (inflation adjusted) figures, rather than nominal, when trying to determine financial balances. Makes sense if you want any easier map to full employment, but budget (flows of income and expenditures) goals/plans/expectations are usually setup in nominal/money terms, as is financial planning with regard to portfolio objectives (stocks of assets and liabilities). Also, remember, given current price deflator methods, real GDP no longer adds up, so identities do not hold in practice. Finally, try to think of useful ways to dynamize this approach, possibly in some SFB form of Harrod-Domar, in a useful diagram. Or alternatively, another way to approach this comparative statics method is a portfolio based economics, starting from balance sheet objectives and real wealth/capital endowments, and tracing out flows associated with the use of assets based on return objectives, expected returns, risk preferences, and risk perceptions. Good luck!